Half-portrait of two women standing close together, staggered, in profile outdoors at Rohwer concentration camp, Rohwer, Arkansas, 1942-1945. Low angle perspective. Women look toward R edge. 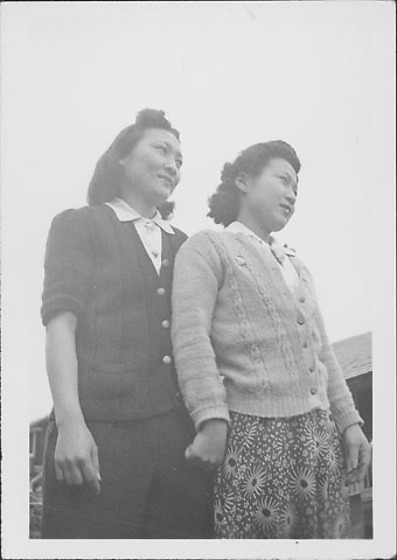 Woman at L wears pants and a dark, short-sleeved sweater over white collared blouse with heart-shaped brooch; woman at R wears a boldly patterned skirt and a light-colored sweater over white collared blouse with flower brooch. Barracks roof in background, R. Same women in 97.292.6BN.